The two–week–long International Summer School «Instant», organised by FOLD and Riga Technical University, will conclude in Cēsis this evening. 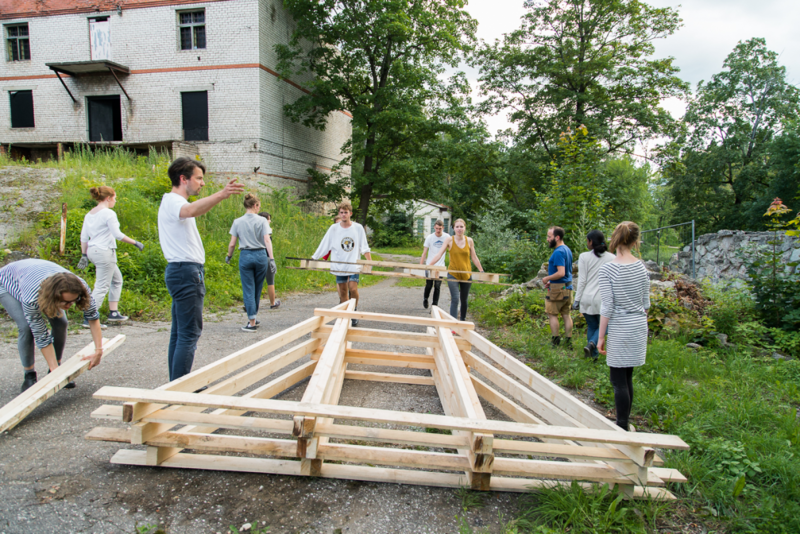 Project presentations will take place at Cēsis Old Brewery at 19.00, followed by the opening spatial installations. Participants of Instant Summer School studied small–scale instant architecture — adaptable, diverse and resilient forms that answer to the urgent needs of our day. This year, the construction site of the Summer School was the most iconic industrial building in Cēsis — the Old Brewery, which is slowly starting its transformation into an arts and science centre. 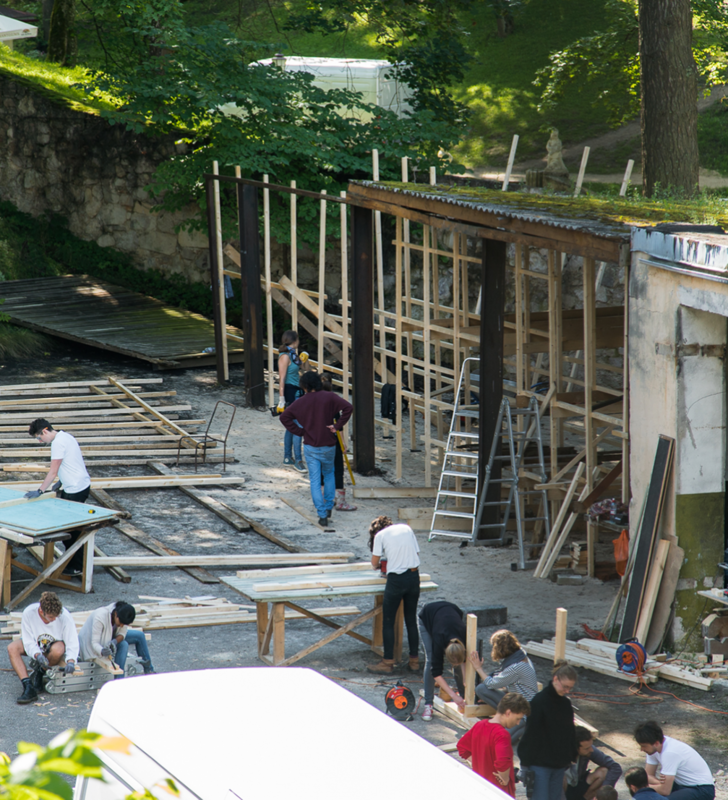 The installations built this year are the largest in the history of the Summer School. The «Prototype» workshop found inspiration in the memories of engineer Imants Priedītis, who worked at Cēsis Beer Brewery during the Soviet period, as well as the bricolage of built structures at the site. The installation «Archive of Truth and Bluff» is a timber frame that takes the visitor on a journey through the construction history of the brewery towards its possible future. It culminates with a terrace in the clouds that opens a view over the Castle Park. The unit is led by Latvian architects Austris Mailītis and Andra Odumāne, as well as their colleague from Japan, Reiji Kobayashi. Participants of the «Building Works Unit» have built a 13–metre bridge «Night Train» — a railway with a movable carriage that in four different positions serves various functions and activates the space around it. At one end the bridge is a table that can be used for site meetings, dinners or celebrations, but at the other end — an overhang into the Castle Park. The carriage is a source of sound and light and accentuates one of the symbols of the brewery — the chimney. The workshop is led by Vienna–based Latvian architect Niklāvs Paegle and his colleagues from London: Thomas Randall–Page and Theodore Molloy. Final presentations and a public discussion. Working language — English, free entrance. Location — Cēsis Old Brewery, Lenču iela 9/11, exhibition space of Cēsis Art Festival with paintings by Paula Zariņa. Opening of installations «Archive of Truth and Bluff» and «Night Train». Locations — in the garages and by the chimney of the Brewery. 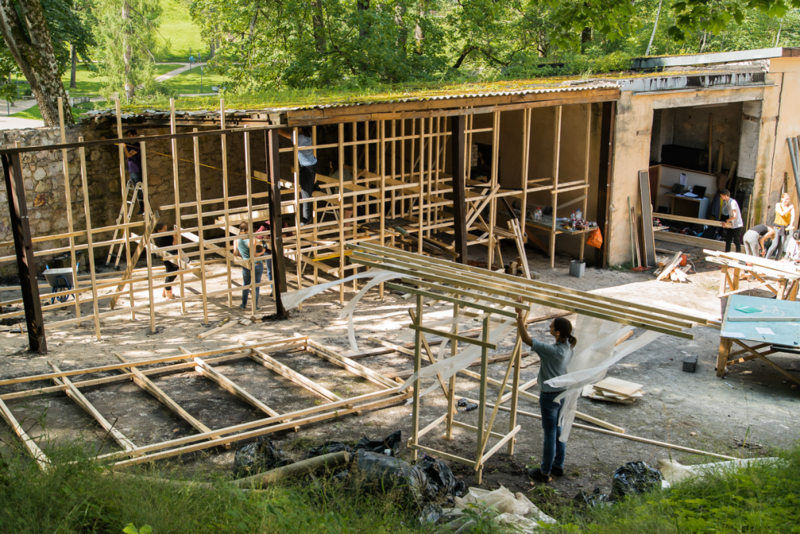 The structures built at the Summer School will be on view until August 14, as well as from August 20 to September 18 during the International Art Biennale «Jeune Création Européenne». More information on Riga Technical University International Summer School is available on its website and Facebook page. FOLD in collaboration with Riga Technical University. State Education Development Agency, Cesis Municipality, State Culture Capital Foundation, Institute for Environmental Solutions, «Rotho Blaas», «Sarma & Norde», «Ķelmēni». To Cēsis Art Festival and Paula Zariņa.